The New Horizons spacecraft is finally close enough to Pluto for its size to be accurately determined: 1,473 miles or 2,370 km in diameter. It is the largest object in the Kuiper Belt, the region of our solar system beyond the planet Neptune. Will this be enough to promote it back to planet from dwarf-planet status? Only time will tell, as it requires a vote of the International Astronomical Union, which demoted the diminutive planet to dwarf-planet status in 2006. Stay tuned and watch for updates from the New Horizons Mission as the satellite flies past Pluto in its closest approach today, July 14, 2005. 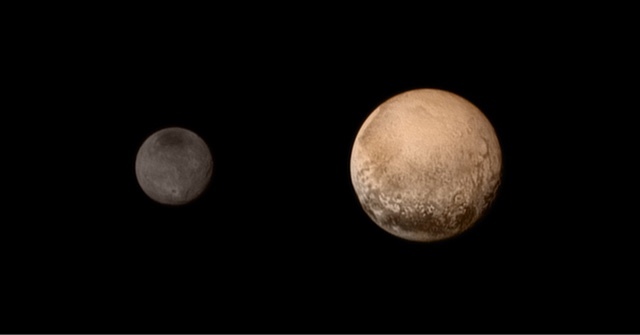 Pluto (right) and its largest moon Charon as New Horizons satellite approaches the system.